1987-1992	Stanford University, Stanford, California, U. S. A.
Ph. D. in Chemical Physics (1992). 1982-1986	National and Capodistrian University of Athens, Athens, Greece. B. S. in Chemistry (1987). Advisor: Dr. J. P. Cowin, Pacific Northwest National Laboratory. Project: Ion-surface reaction dynamics of thin films. Ion mobility in thin films of hexane and water grown on Pt and the dielectric properties of these substrates are studied as a function of sample history and temperature by monitoring surface voltages with an oscillating electrode (Kelvin probe). Advisor: Prof. S. T. Ceyer, Massachusetts Institute of Technology. Project: Gas-surface reaction dynamics of fluorine and xenon difluoride on a silicon crystal. 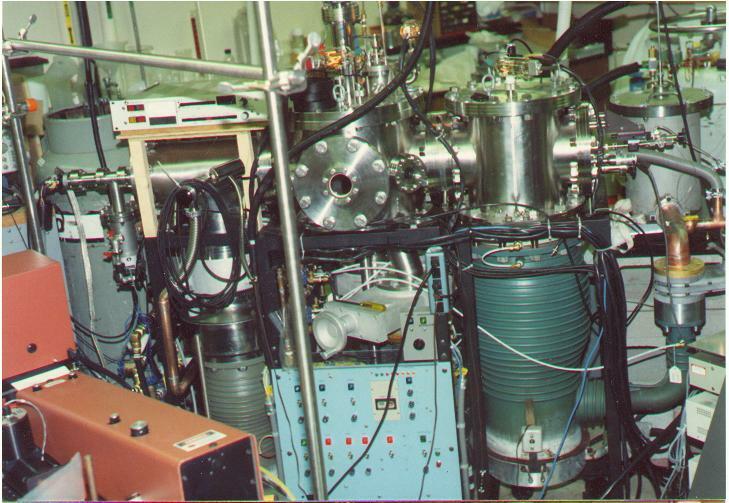 The etching reactions of Si by F2 were studied using an ultra-high vacuum scattering machine equipped with a rotatable mass spectrometer. A new reaction mechanism was observed and Si etching with fast F2 beams was demonstrated. Similar studies of Si etching with XeF2 revealed the ejection of fast XeF and very fast F fragments during the early stages of the reaction. Project: Reaction dynamics of the reaction Ba + HI -> BaI + H.
Product rotational distributions were determined by laser induced fluorescence and combined with reagent relative velocity data to provide information on the impact parameter of the reagents that yielded product molecules in specific vibrational states. Studies were done under crossed beam and beam - gas conditions. Project: Developed hardware and software to interface titration and stripping voltammetry equipment to microcomputer. Project: Worked on an educational computer program presenting the concept of bioavailability of drugs. Scholarship for Academic Achievement, N. U. of Athens. Building and maintaining ultra high vacuum systems. Generating atomic, molecular, and ion beams. Handling toxic gases and gases under high pressure. Operating and maintaining high resolution lasers. Detecting stable and transient species in the gas phase through mass spectrometric and spectroscopic techniques using ion and photon counting, lock-in and gated integration, and time-of-flight methods. Studying crystal surface structure and composition using Auger spectroscopy, low energy helium diffraction methods, and ion sputtering. Designing, building and trouble shooting electronic circuits. Interfacing laboratory equipment to computers. Computer programming in several operating systems (VMS, Unix, DOS) and languages (Fortran, Basic, Assembly); problems addressed included minimization (fitting) and simulations. Managing networked workstations and utilizing Internet resources. Chemically separating and purifying precious metals. 1986-1987	Military service in the Greek Navy. "Laser spectroscopy of crossed molecular beams: The dissociation energy of BaI from energy-balance measurements", P. H. Vaccaro, D. Zhao, A. A. Tsekouras, C. A. Leach, W. E. Ernst, and R. N. Zare, J. Chem. Phys. 93, 8544 (1990). "Analysis of BaI C2P-X2S+(0,0) Band for High Rotational Levels", D. Zhao, P. H. Vaccaro, A. A. Tsekouras, C. A. Leach, and R. N. Zare, J. Mol. Spectrosc. 148, 226 (1991). "Indirect information on reactive transition states from conservation of angular momentum", C. A. Leach, A. A. Tsekouras, P. H. Vaccaro, R. N. Zare, and D. Zhao, Faraday Discuss. Chem. Soc. , 91, 183 (1991). "Experimental determination of the specific opacity function for the Ba + HI ® BaI(v=0) + H reaction", P. H. Vaccaro, A. A. Tsekouras, D. Zhao, C. A. Leach, and R. N. Zare, J. Chem. Phys. 96, 2786 (1992). "Rotational analysis of the BaI C2P-X2S+ band system for the Dv=0 progression (v=0-12)", C. A. Leach, A. A. Tsekouras, and R. N. Zare, J. Mol. Spectrosc . 153, 59 (1992). "Product rotational distributions and specific opacity functions for the reaction Ba + HI ® BaI (v=0,4,8,12,16,18) + H ", A. A. Tsekouras, C. A. Leach, K. S. Kalogerakis, and R. N. Zare, J. Chem. Phys. 97, 7220 (1992). "Experimental verification of a new mechanism for dissociative chemisorption: Atom abstraction", Y. L. Li, D. P. Pullman, J. J. Yang, A. A. Tsekouras, D. B. Gosalvez, K. B. Laughlin, Z. Zhang, M. T. Schulberg, D. J. Gladstone, M. McGonigal and S. T. Ceyer, Phys. Rev. Lett. 74, 2603 (1995). "Ion beam source for soft-landing deposition", J. P. Biesecker, G. B. Ellison, H. Wang, M. J. Iedema, A. A. Tsekouras, and J. P. Cowin, Rev. Sci. Instrum. 69, 485 (1998). "Soft-landed Ions: A route to Ionic Solution Studies", A. A. Tsekouras, M. J. Iedema, G. B. Ellison, J. P. Cowin, Int. J. Mass Spectrom. Ion Procecces 174, 219 (1998). "Amorphous water ice relaxations measured with soft-landed ions", A. A. Tsekouras, M. J. Iedema, and J. P. Cowin, Phys. Rev. Lett. 80, 5798 (1998). "Ferroelectricity in Water Ice", M. J. Iedema, M. J. Dresser, D. L. Doering, J. B. Rowland, W. P. Hess, A. A. Tsekouras, and J. P. Cowin, J. Phys. Chem. B 102, 9203 (1998). "Immobility of protons in ice from 30 to 190 K", J. P. Cowin, A. A. Tsekouras, M. J. Iedema, K. Wu & G. B. Ellison, Nature 398, 405 (1999). "Soft-landed ion diffusion studies on vapor-deposited hydrocarbon films", A. A. Tsekouras, M. J. Iedema, and J. P. Cowin , J. Chem. Phys. 111, 2222 (1999). "Fluorine atom abstraction by Si(100). I. Experimental", M. R. Tate, D. Gosalvez-Blanco, D. P. Pullman, A. A. Tsekouras, Y. L. Li, J. J. Yang, K. B. Laughlin, S. C. Eckman, M. F. Bertino, and S. T. Ceyer, J. Chem. Phys. 111, 3679 (1999). "Probing aqueous-organic interfaces with soft-landed ions", K. Wu, M. J. Iedema, A. A. Tsekouras, and J. P. Cowin, Nucl. Instr. and Meth. in Phys. Res. B 157, 259 (1999). "Fluorine atom abstraction by Si(100). II. Model", M. R. Tate, D. P. Pullman, Y. L. Li, D. Gosalvez-Blanco, A. A. Tsekouras, and S. T. Ceyer, J. Chem. Phys. 112 5190 (2000). "Reactivity of Fluorinated Si(100) with F2", D. P. Pullman, A. A. Tsekouras, Y. L. Li, J. J. Yang, M. R. Tate, D. B. Gosalvez, K. B. Laughlin, M. T. Schulberg, and S. T. Ceyer, J. Phys. Chem. B 105 486 (2001). "Determination of specific opacity functions", poster presented at the Conference on the Dynamics of Molecular Collisions, Asilomar, Calif., 1989. "Rotational distributions and opacity functions for the reaction Ba + HI -> BaI(v=0) + H", poster presented at the Conference on the Dynamics of Molecular Collisions, Lake George, N. York, 1991. "Dynamics of the Ba + HI reaction: BaI(v) rotational distributions and specific opacity functions", poster presented at the XIVth International Symposium on Molecular Beams, Asilomar, Calif., 1992. 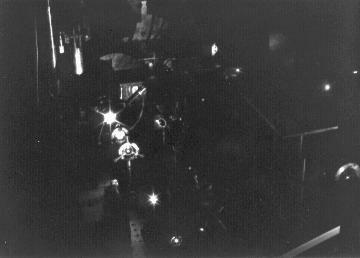 "Molecular beam studies of XeF2 on Si(100)", poster presented at the Conference on the Dynamics of Molecular Collisions, Asilomar, Calif., 1995. 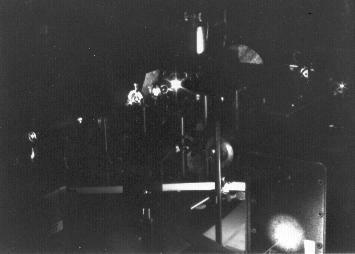 "Molecular beam studies of XeF2 on Si(100)", poster presented at the Gordon Research Conference on Dynamics on Surfaces, Andover, N.H., 1995. "Etching Dynamics of Silicon with Xenon Difluoride", seminar talk at the Center for Atomic-scale Materials Physics, Technical University of Denmark, Lyngby, Denmark, 1996. 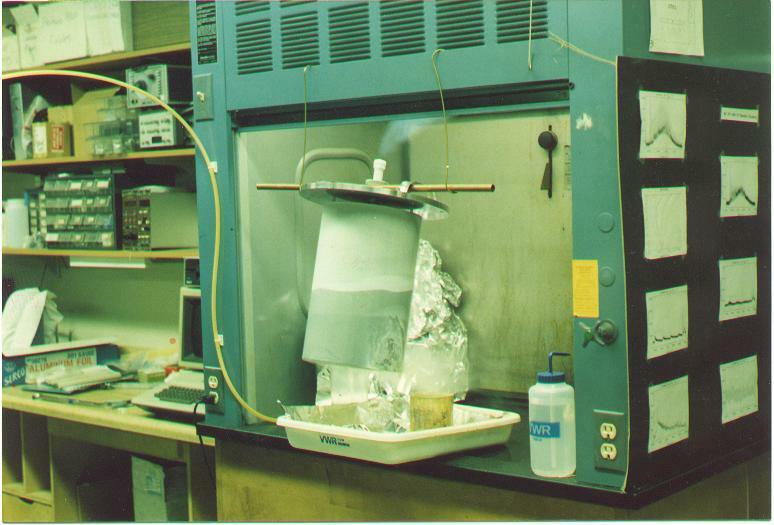 "Soft landing and mobility of Cs+ ions on hexane ice", poster presented at the Conference on the Dynamics of Molecular Collisions, Gull Lake, Minn., 1997. "Soft-landed Cs+ and D3O+ ion studies on D2O ice, poster presented at the Gordon Research Conference on Dynamics at Surfaces, Andover, N.H., 1997. "Current topics in Physical Chemistry", talk at the Popular University, Athens, Greece, 1998. "Electrochemistry in vacuo: Ion studies on thin ice films", seminar talk in the Department of Chemistry, University of Athens, Greece, 1998. "Studies of thin ice films with low energy ions", seminar talk at the Institute of Electronic Structure and Lasers, Foundation for Research and Technology-Hellas, Heraklion, Crete, 1998.